I’ve been bitten by the Oldhammer bug it seems. After couple of intensive painting sessions with the old school Gobbos I noticed a strong urge to paint more old lead. Thankfully I’ve got plenty of it in my drawers. It has been my long term plan to build and paint a small band of adventurers in the spirit of the first edition Warhammer Fantasy Roleplay. The games we played with my friends were usually very short and brutal, ending in events like a venturesome confrontation with a herd of Skaven emerging from the sewer systems of the city or something similar. The deaths were not worthy of songs. Limbs and heads fled and everybody died one way or another. But we kept creating new characters, sometimes boosting them with skill vantages and better gear, trying to survive longer than mere one game session. The characters were like matches lit and thrown away. But I think that was one part of the charm. The brutality of the game and hopeless effort to stay alive just for the next game. But now back to my vision. I dug in to my archives of old lead and found couple of very suitable personalities for my plans; a classic Berserker with two swinging swords in his hands and a crazy looking Harald (Harry) the Hammerer from the set of Heroic Fighters of the Known World, both sculpted by no other than the legendary Jes Goodwin. I decided that they would be the first two characters in the jagged band of adventurers. Both characters represent the time I got into miniature hobby and they have lot of personality in them that speak to me. The first one, Berserker, is now primed and ready for some serious painting. But before I rushed in to picking up the brushes I wanted to make something to visualize my ideas and guide me in the painting process – moodboard. It might not be the most logical and a bit over the top set of images put in one place, but it works for me. The character is visually very barbarous. His pose is violent and the look on his face is fierce. So I thought to give him somewhat tribal yet very nordic grip that would fit to his outlook, finally pushing it all back in to the 80’s Old World with familiar patterns. Finnish nature is a strong source of inspiration for me. I’ve tried to recreate it in a way in some of my previous projects, like in the case of the Goblyn Slayer and the recent Gobbos. The results have been quite acceptable, but I’m still trying find a way to give it more depth. This task will continue in the case of the Berserker. The base of Goblyn Slayer. Finnish swamps with their small white cotton grass flowers gave me the inspiration for this character’s base. So that’s about the plan so far. I still need to gather some inspiring images for Harald’s moodboard, which I’ll be sharing here when it is done. After that, we’ll se how this will turn out. Do you create moodboards for your projects or do you just jump right in to painting when you’ve assembled your minis? Smacked by that base! 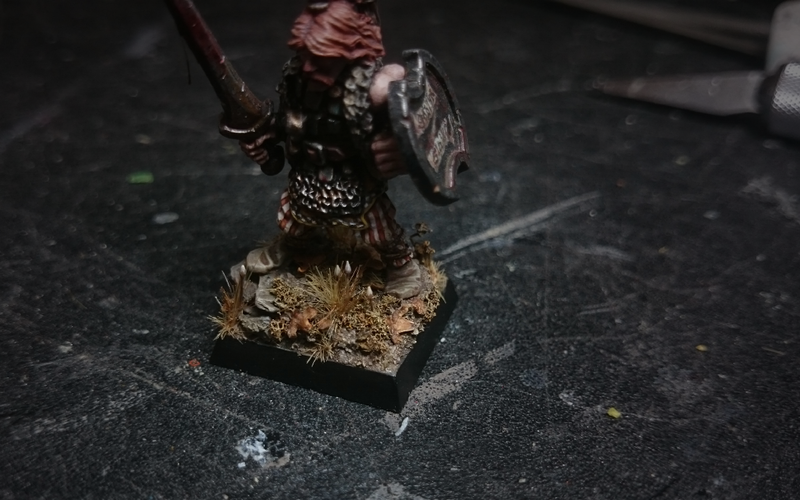 You have to do a methods & tools blog post for basing my friend! Thanks Toni! I’m thinking of making a step-by-step “painting lecture” with this guy, maybe even using video. The base and how-to will be part of that plan. Nice mood board – and great choice of mini! Those old barbarians rock! Cheers mate! That is the way I paint most of the time, but I decided to try something different this time around. Jes is my all time favourite sculptor. His style is so recognizable and unique in a way. As ‘grim’ (an adjective actually used on the back of the rulebook to describe the world) as 1st Ed WHFRP was it was also interspersed with some subtle humour to balance it. Our characters tended to last longer than just one session, your GM must have been pretty heavy handed to total party kill after every game! 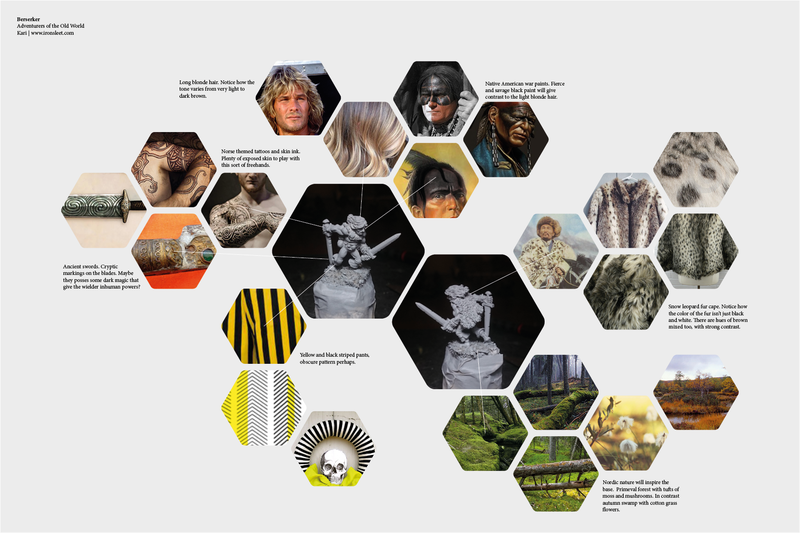 The mood board is a good idea for formulating painting schemes although I tend to just save images along the way for reference rather than pasting them into a collage. I agree with Toni that we need to see how you made the base. It looks great. Yeah, we were kids and rushed in to the battle every time it was possible. Guess the subtle humour was one of the things that made it so special. I’m much like Jeff in that I do plan and map it out mentally before I start. However I usually stick to my plans hence I usually have a steady progress when I first get started. Other than that I’m very interested in this project as I’ve picked up the original Necromunda books so I’m kinda in the same position as you are. I can’t wait to see more. I’ve just finished my last Jes Goodwin chaos warrior and I’m dying for more. That oldhammer bug is easy to catch. I’ve never heard of a moodboard before, but it looks like a great idea. I usually use a picture or two as inspiration when I paint a miniature. With my chaos warriors I wanted to create unity with their bases so I used zdzisław beksiński landscape artwork to get the colors and mood right between the bases. There’s something comical and cartoonish in those old Chaos Warriors that attracts us. One piece artworks do work as a great source of inspiration to me too. For instance when painting the Oldhammer Dwarfs I used Akseli Gallen-Kallela’s Kalevala related work as a reference for the palette. Great article – I love the way you’ve put the mood-board together for this guy, and that base is beautiful. I usually have an idea in my head when I approach a model, but I pretty much wing it when it comes to actually painting… maybe I need to get more organised! This is the second time I’ve seen Patrick Swayze used as a reference for a miniature in less than a week by the way… weird! i do moodboards as well, but they are never that fancy as yours. they are just a medly of handwritten notes, printed pics from the internet cut to size. maybe list for colour recipe´s or even some papers with colour tests on. my moodboards are all done in a black book with blank pages so i can check back if i need something form older projects. Next Post Vlka Fenryka – One year in the Aett!